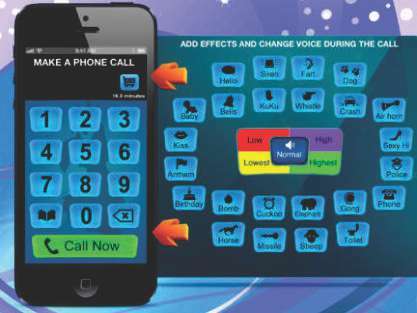 Available Voice changer applications in the digital market are very less in number. This can be due to admittedly small audience. 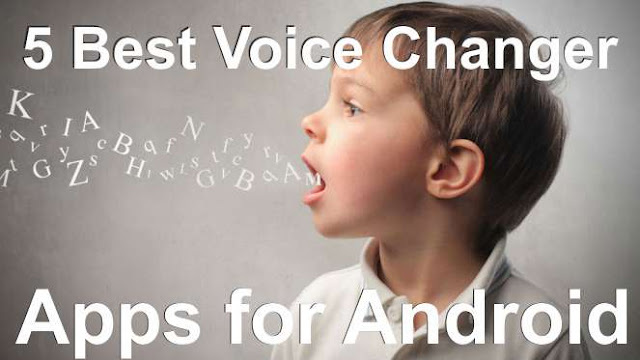 There are few developers who have created decent voice changing applications for Android users. Most of the apps are for real time voice changing which can be used for genuine purposes whereas, other apps are just for playing pranks with friends and family. It might not have the best name but it definitely gives you the best features of a voice changer app. This app allows you to choose from a variety of voices available in the application; Darth Vader, Robot, Helium, Megaphone and many more. You can very easily use these voices as your ringtone, notification tone, alarm tone, WhatsApp messages and much more. 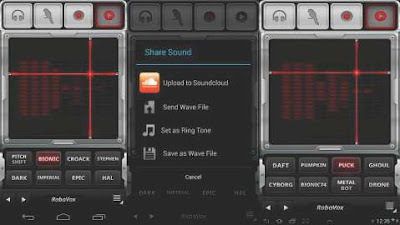 It is a great application for people who are creative enough to play with their voices and create something new through their smartphones. It provides you with different filters, cool features and effective user interface. Undoubtedly, with some optimization Voice changer with effects can be a lot better than you can think! 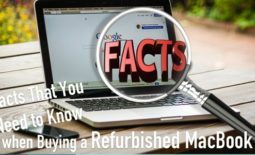 It may not be the best voice changer in the virtual market today, but still it provides you with amazing features to notice. It gives you a good amount of filter and effects which can help you to change pre recorded voices or fresh audios easily. The user interface in quite old school as compared to other voice changing applications. But the features are totally new and refreshing. You can use your creations for your ringtones or as messages to friends. It is totally free of cost for Android users. RoboVox is the only paid voice changing application in the market. But certainly, it’s worth it! There are more than 32 effects that can change your voice in different ways. You can transform your voice into some popular ones like Helium, HAL, Dalek, Cylon, Darth Vader and Chipmunk. I am sure this would be a great attraction for science fiction fans. It can modify your voice through different modes. And it will modify your pitch and modulation as well. It is available for free as well as paid version, the only issue is that it restricts some of the features in the freemium version. 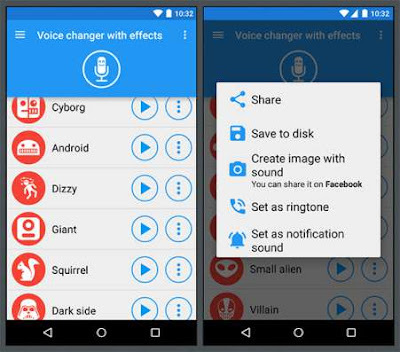 Indeed, one of the best voice changer you can download on your phone! Voice changer displays a very simple and common name. 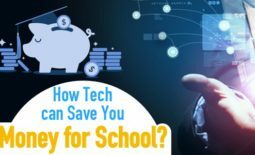 Let me tell you that this application is quite simple and easy to use. With Voice Recorder you can record your voice, give effects to it, use filters to enhance the quality and save it in your library. Then of course, you can use it as messages on WhatsApp or ringtones on your smartphone. It has a very simplistic user interface which makes your voice changing experience quite delightful. If you want to play a prank with your friend or scare them through your voice then you have landed up on the right place. 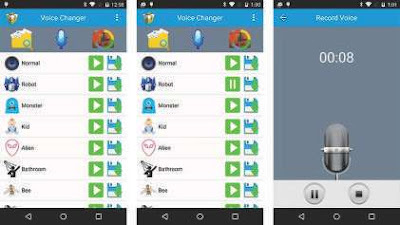 Voice changer (Prank) allows you to record your voice with 64 different sound effects like cricket noise, train passing by and many more. You can add fake environment sounds to make your voice sound more realistic. Users can share the the recorded voice with friends on WhatsApp, for that matter on Facebook too. The application also has an alien lip sync mode, where you speak and the robot lips copy you. Though. It does not work very well on your smartphones, it can be tried out. 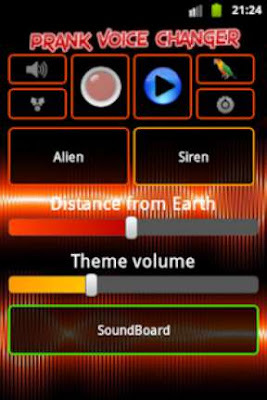 Overall an amazing application for recording voices and sharing it with friends! These were the top 5 voice changer applications. You can enjoy the apps for free as well as in premium version. We would recommend you to switch to premium version after trying out the free options. It would be a great experience on these apps, believe me, you’ll really enjoy working with them! 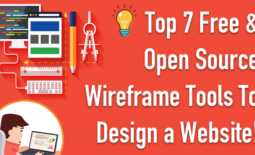 This post has been contributed by Swati Sharma from Bloomtimes.